Now that you’ve got a gun safe for protecting your weapons, the next big question is – where to put it? In fact, the location of your gun safe is more important than the quality of the safe itself! A secure and well-hidden location makes up for the technical flaws and inferior quality of your gun safe. At the end of the day it’s not what gun safe you buy but where you place it that makes all the difference. Discussed below are some practical locations for your gun safes that not only enhance the décor but are super secure as well. Check them out. 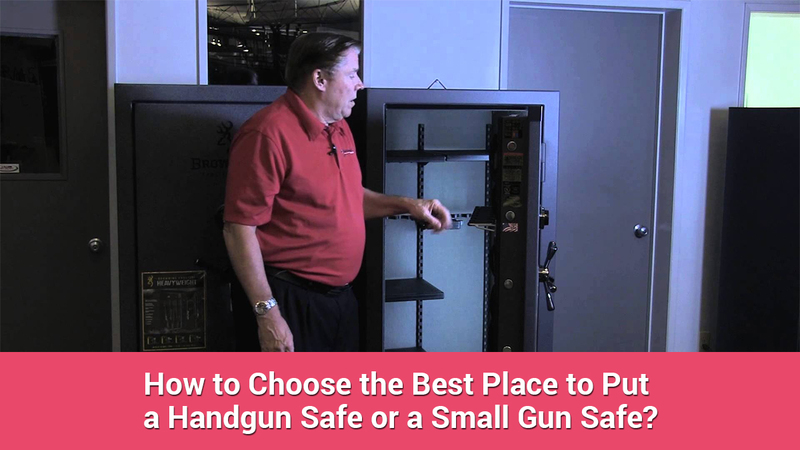 Before you start, make a list of places where you can put the safe. The location must be well hidden but accessible. Keeping it in the guest room is risky as it might get unwanted attention, while keeping it in the basement would be hard to move. Most users usually place it in the bedroom, a place where it is close to you and away from the prying eyes of strangers as well. Even your office is a safe location to put the safe. It is not necessary that you install a gun safe on the floors; there are so many other places that offer better convenience and style! For instance gun safes built inside a cupboard or a wall increases the toughness of the cabinet. For small sized hand gun cabinets and safes chests and drawers are a unique option. You can even install a hand gun safe in your vehicle for better access. These innovative safes can blend in better with the surroundings than the conventional gun safe. Once you’ve narrowed down your options, the next step is to take note of the risks involved. As a gun owner your first priority must be to keep your weapons away from the reach of children and other family members, then comes safeguarding your guns from theft and other accidents. But that’s not all, you even have to protect your valuables from the natural elements such as fire, water etc. Gun safes are firmly locked but have proper air circulation; hence, the arms placed inside are affected by the temperature fluctuations in the atmosphere. If you’re living in the tropical zone, humidity can be a major problem for your guns. Basements and garden sheds are usually damp and cool while the top floors are prone to heat; choose a place that has constant temperature. The thieves usually head straight towards the bedroom, office and living room as soon as they break in. This is because these locations are the most obvious choice for placing the safes. To prevent this, keep it away from the prying eyes of strangers. Also ensure that the safe is not directly visible to anyone outside from a window. Most gun safes are fire resistant, if not you can always attach an extra sprinkler on top of it, an affordable and useful hack for users who cannot afford expensive cabinets. Also it will be best if you place the gun safe away from fire prone areas such as the kitchen. In case of floods, the higher the gun safe is located, the better it is. Hefty weight and thick construction material of the gun safe do not guarantee total safety; an experienced criminal might still crack it with a sledge hammer or saw. Firmly fixing the gun safe to the ground makes it almost unbreakable and impossible to move. Proper installation and anchoring of the gun safe adds on to its strength. Also a heavy safe only gives you a backache; go for a compact and portable gun safe that is easy to move around. Hire professionals to help with the installation services or do it yourself. The type of flooring is an important aspect if you’re planning on anchoring your gun safe. Good quality solid hardwood flooring is usually easy for anchoring than tiles and marble floors. Sturdy concrete floors are preferable to soft carpets that are only a hindrance. Also ensure that the floor can bear the weight of the safe, for instance go for a small safe weighing under a 1000lbs if you want it installed on the first floor. Consult a carpenter and measure the dimensions to check if the location can accommodate the safe. Also before you begin with the anchoring consider the plumbing and wire connections once. Installing the safe on uneven flooring might affect the locking system of the gun safe. The locks and bolts won’t work properly if the cabinet is not leveled. This leads to the door slamming shut or opening on its own accord, and might cause some serious damage to your fingers. A misaligned gun safe is easily accessible and more prone to theft; hire a locksmith to solve the problem. Also for anchoring shims are better than bolts, providing stability and strength to the gun safe. Place it at least 5 feet away from the ground to keep it out of the reach of children. Proper anchoring and bolting is necessary. Block the extra mounting holes in the safe. Other than the points mentioned above gun safes also add on to the beauty of the house. Available in many colors and designs it can be used as a wonderful home décor item. The location of the gun safe is a matter of convenience and security, go for a place that does not gather unwanted attention but is easy to access as well. Biometric Gun Safe Vs Traditional Gun Safes - Which One You Should Prefer?